Apparently, the Move's discography is so complex that not even a lovingly compiled, rarities-laden, career-spanning box set like Salvo's 2008Anthology 1966-1972 can fit everything within the confines of four discs. The devil is in the licensing, as it always is, something that always plagues Move compilations because their last album, Message from the Country, was on Harvest, while their first two -- The Move and Shazam -- were on EMI and the third, Looking On, was on Fly. Typically, the first three albums are grouped together -- as they were on WestSide's 1997 box Movements -- with Message from the Country left lingering on its own, a situation Salvo almost avoids on Anthology by cherry-picking the low-riding heavy blues-rocker "Ella James" and loading up the fourth disc with the wonderful post-Message singles that captured the band at some kind of a zenith: "Tonight," "Do Ya," "Chinatown," "California Man." Although there are parts of Message that are sorely missed, this is enough to help Anthology paint a portrait of the band's full career, but it's a portrait that's slightly skewed, largely because the set relies so heavily on alternate takes and rarities. This approach makes Anthology manna for collectors -- who very well may be the only audience for such a comprehensive box set in 2008 -- as this piles on different mixes, markedly different alternate versions such as an "early piano version" of "Fire Brigade," and a simple acoustic version of "Flowers in the Rain," a bevy of single edits, and a few enhanced stereo takes, plus studio chatter from producer Tony Visconti. It's such a twisting maze that a good guide is necessary and the liner notes by Mark Paytress provide just that with a biographical overview and track-by-track liners. Yet even that is an indication that this box set is intended not as a one-stop for neophytes but a supplement to Salvo's expanded reissues (and EMI's expansion) of Message, as a whopping 30 of the 62 tracks here are previously unreleased, with another seven making their CD debut. 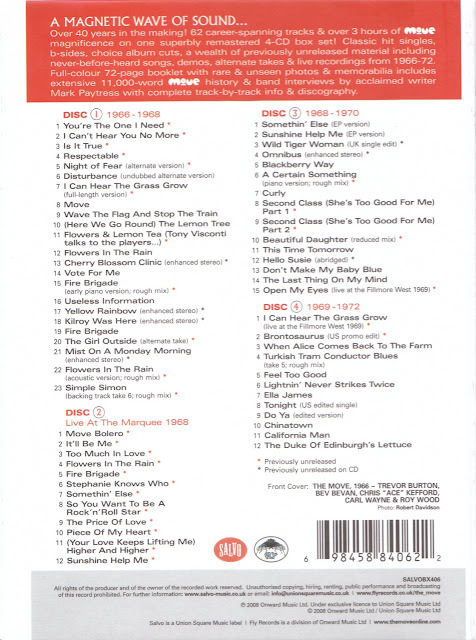 Of course, many of these are alternate mixes and takes, but there are some nice unheard items too, including the two-part "Second Class" the early version of Roy Wood's "She's Too Good for Me," and, best of all, four pre-debut tracks that find the band sounding like a Tamla-influenced British beat band, something they never quite were in their art-terrorist incarnation. But in addition to these alternate takes comes an entire disc's worth of unreleased music from the band live at the Marquee in 1968, which is another huge incentive for collectors to pick this up. Some of this was excerpted as the Something Else EP but this gives up a full 12 tracks of the Move at the peak of their powers and they sound monstrous: huge, lumbering, loud, as progressive and primal as the Who, but at once stranger and more of a down and dirty rock & roll band, kicking out versions of "Somethin' Else," "Stephanie Knows Who," "Piece of My Heart," "(Your Love Keeps Lifting Me) Higher and Higher," and "So You Want to Be a Rock & Roll Star." The power of this set, along with the blistering version of "I Can Hear the Grass Grow" and the Nazz's "Open My Eyes" from the Fillmore West in 1969, may be the biggest revelation of the set, and it's also why this collector-bait heavy box isn't just for collectors. Sure, this is loaded up with rarities, but it does give the arc of the band's career, contains most -- but certainly not all -- of their great songs, and provides jolt after jolt of weird, wild, wonderful rock and pop, music that still has the power to intoxicate all these years later. 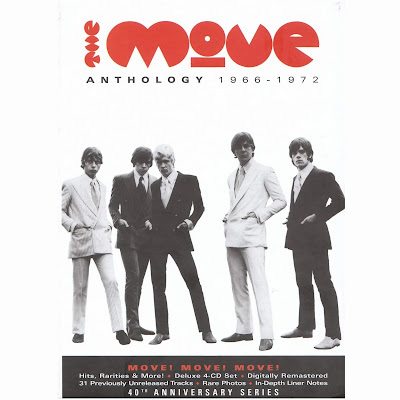 If you're already one of the converted this is essential, but if you haven't learned how to love the Move, this box may still be necessary as there is no one album that contains all their sounds in one place. Besides, the Move were too big to be contained by one box -- at least this one comes the closest to getting it all right.